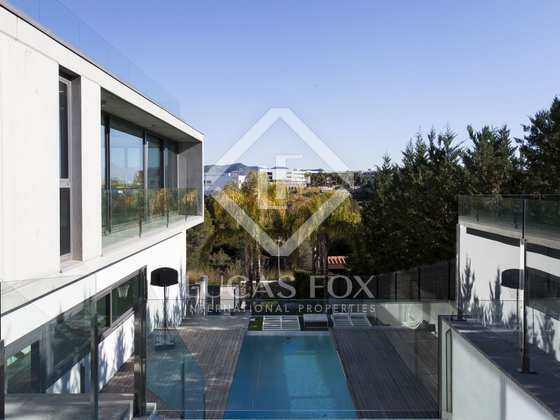 Outstanding ultra-modern villa with views of the sea and golf course in the exclusve Can Girona neighbourhood of Sitges. 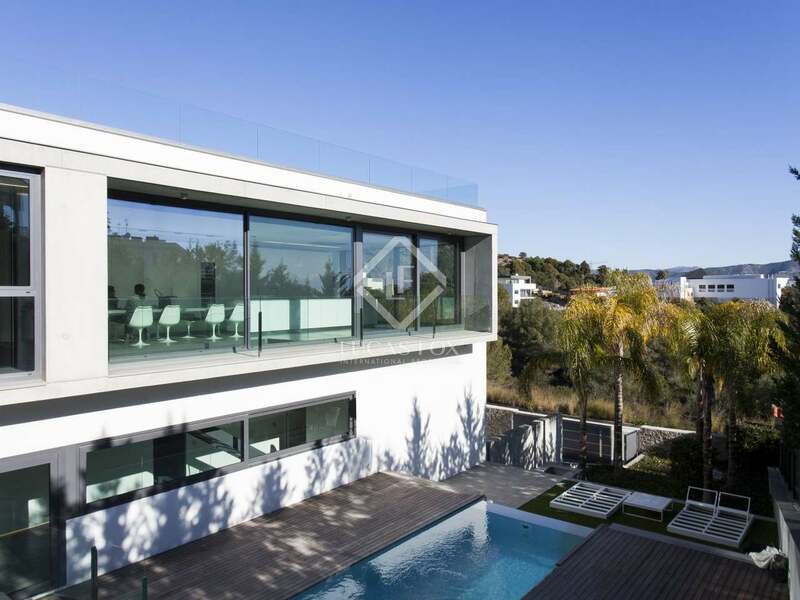 In a quiet, exclusive Sitges neighbourhood with 24-hour security we find this high-end contemporary design villa with lovely sea and golf views that was built in 2010 and has a built area of 487 m². 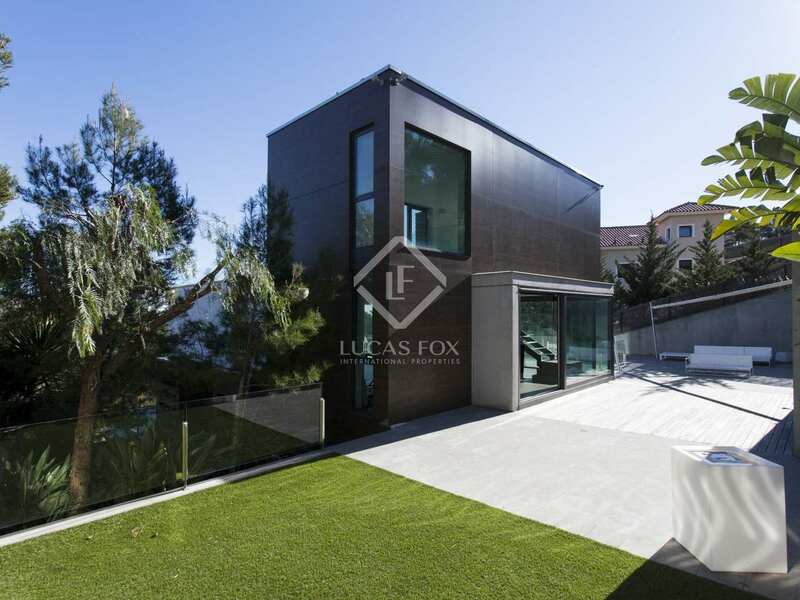 The cube-like contemporary design villa is neatly surrounded by a terraced garden with low maintenance tropical plants decorating the several paved terraces and areas with tropical wood decking, automatic sail awnings and a jacuzzi that runs into the elongated swimming pool. 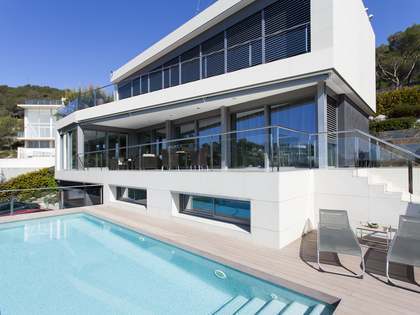 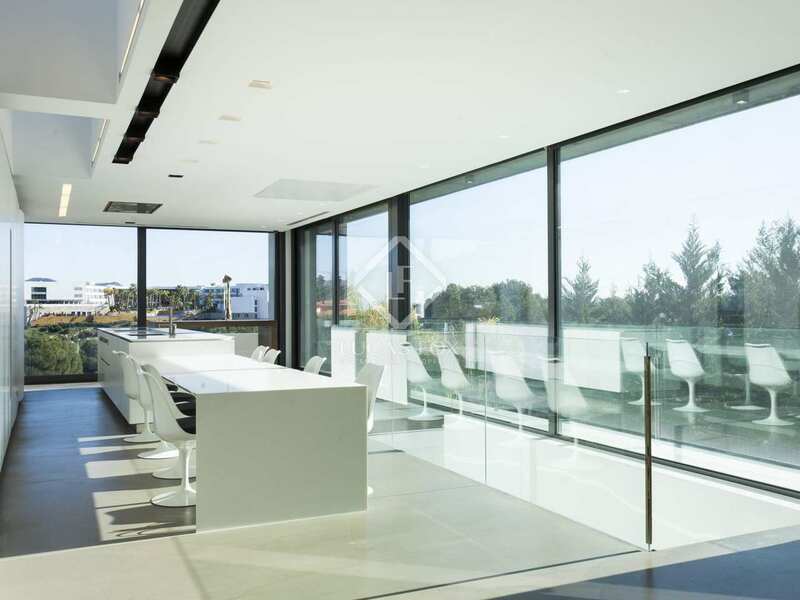 Inside the villa we are met with clean lines, huge floor-to-ceiling windows and polished cement floors. 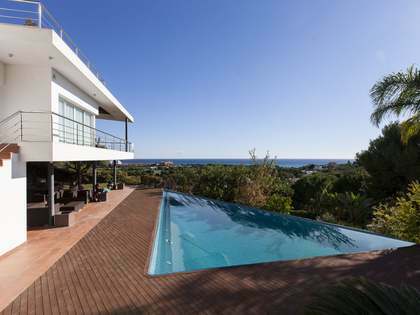 The villa is spread over several levels with the main living areas on the second floor. 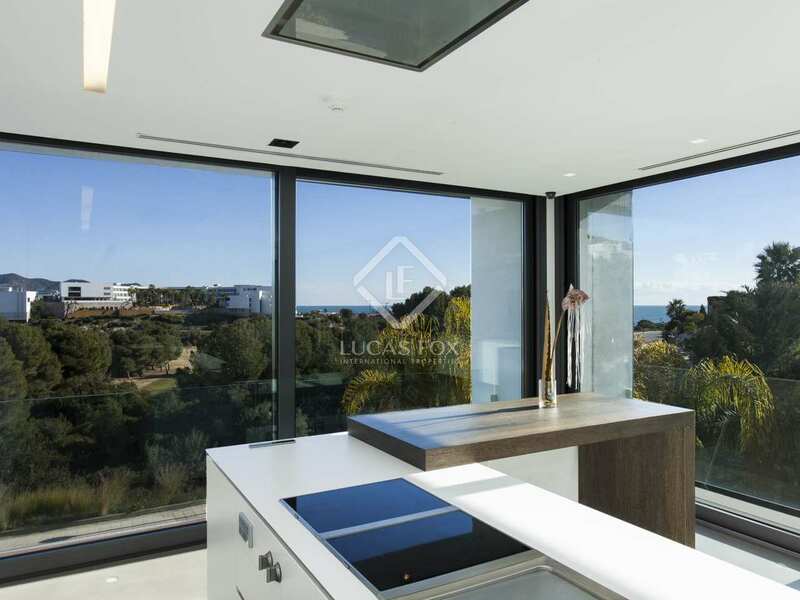 Here we find a large Boffi design kitchen with a long island with Corian worktop, double fridge, Gaggenau appliances, induction hob and Teppenyaki grill. 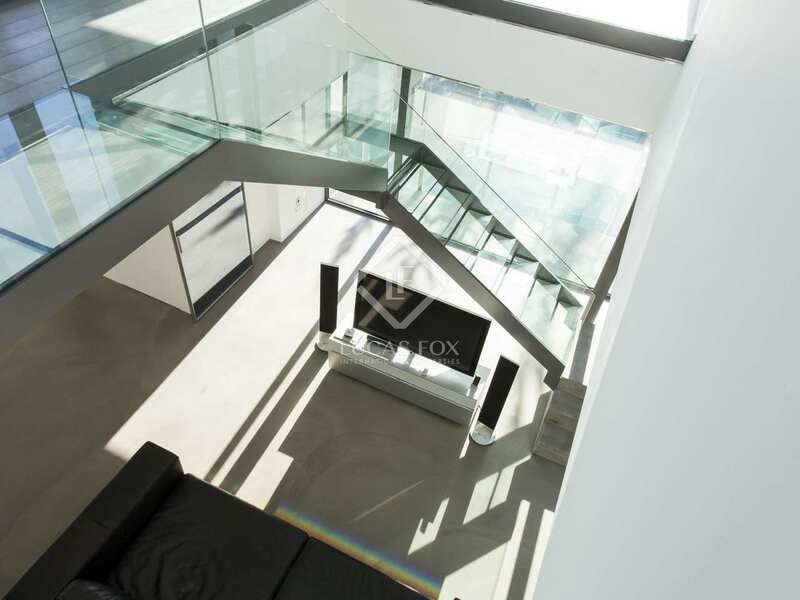 The living area features a TV which can be neatly concealed in the ceiling when not in use so as not to obstruct the views, with a remote control to change the angle. 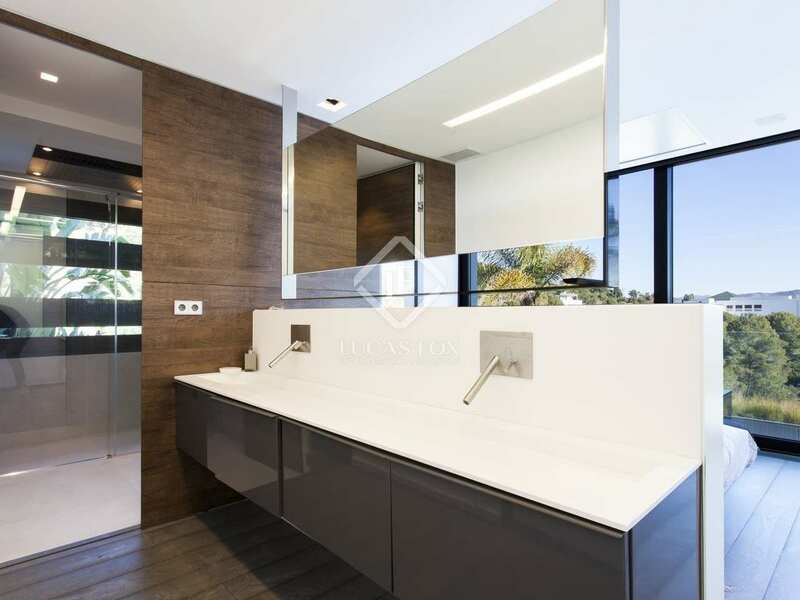 A second TV of this kind is in the master bedroom. 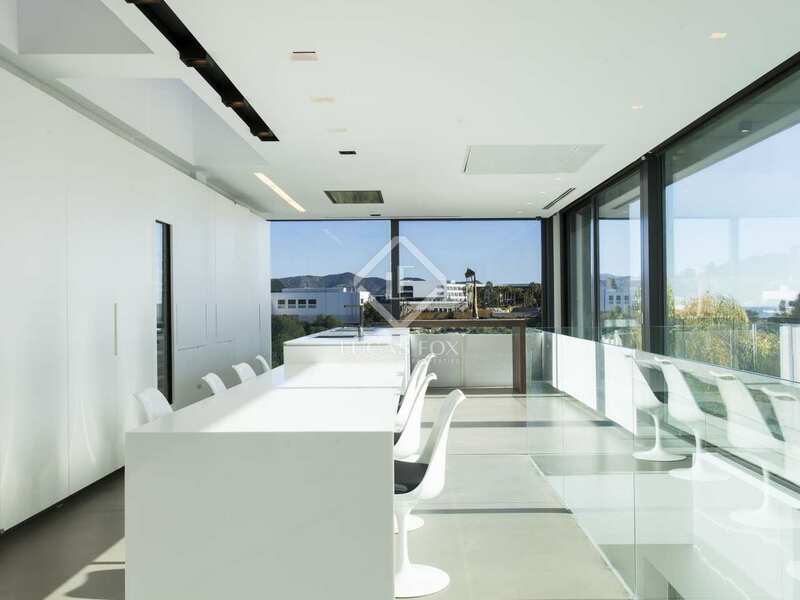 Off the living area is a separate room with sliding walls that could be used as an office or playroom. 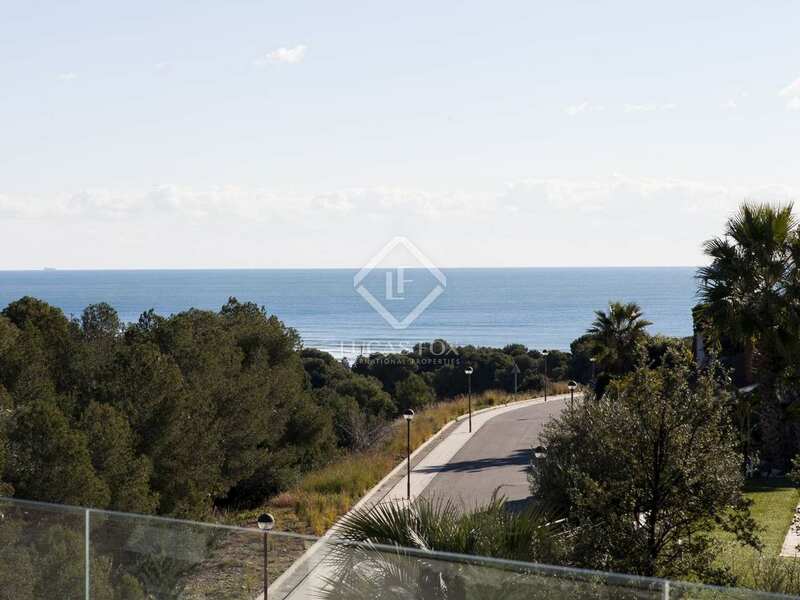 The living areas are all surrounded by glass with views of the sea and golf course and provide access to the large terrace with the jacuzzi. 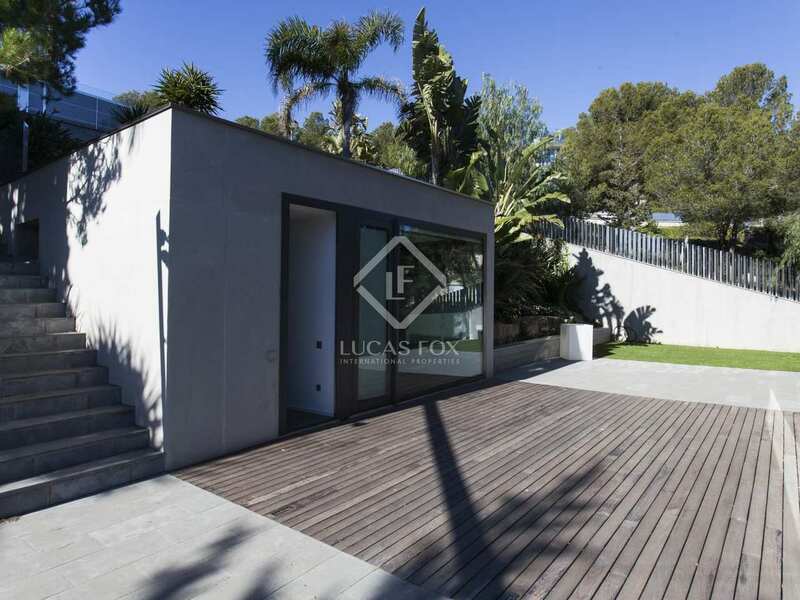 A separate annex, which has its own bathroom, may be connected to the main house with a glass walkway or pergola. 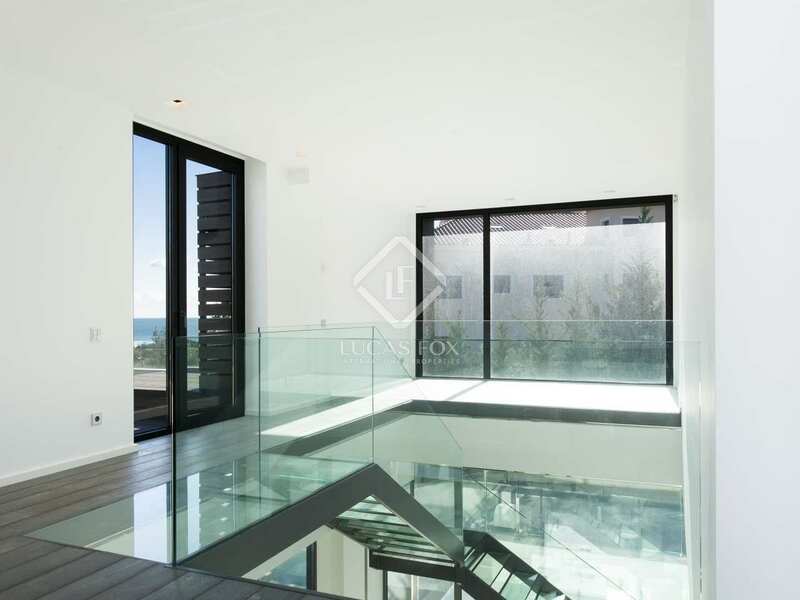 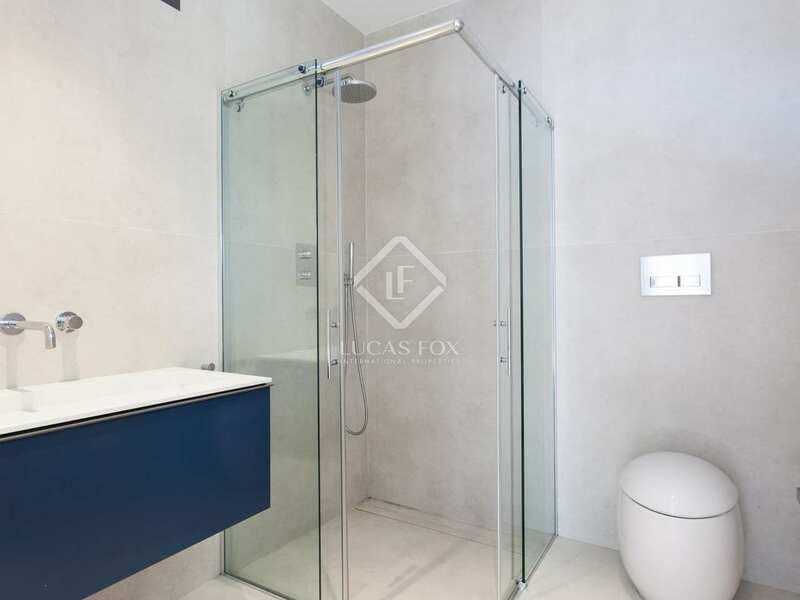 The floor above this offers an open-plan space leading to a large roof terrace with amazing sea views while the lower floor houses 3 bathrooms and 4 double bedrooms with high quality wooden floors, also offering access to the pool area. 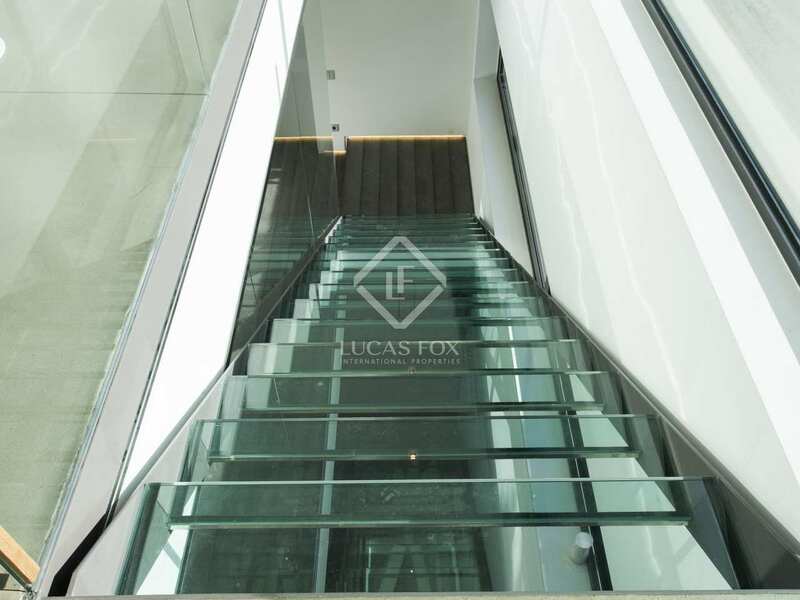 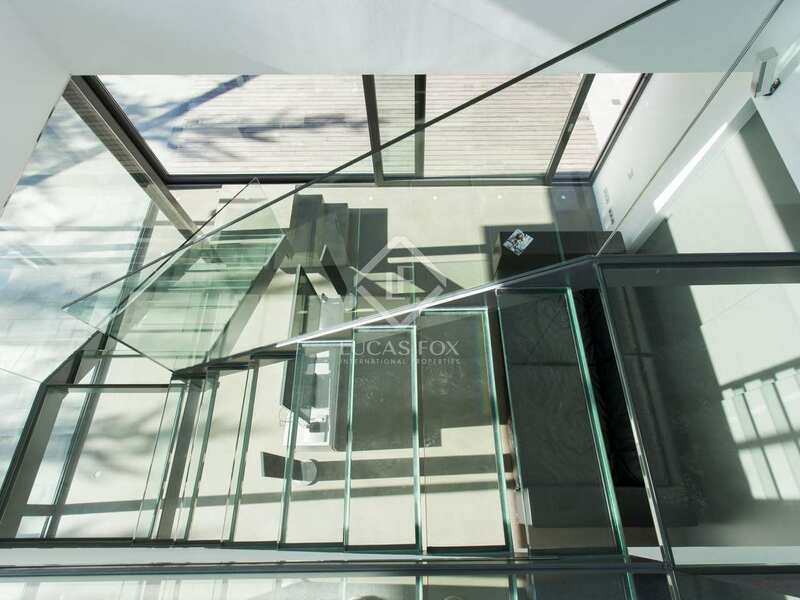 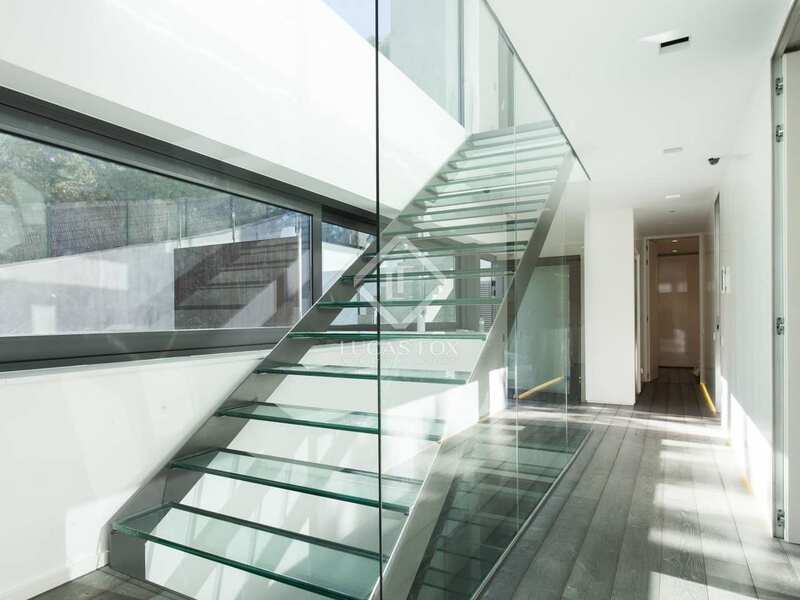 A stunning glass staircase and glass lift connect the various floors. 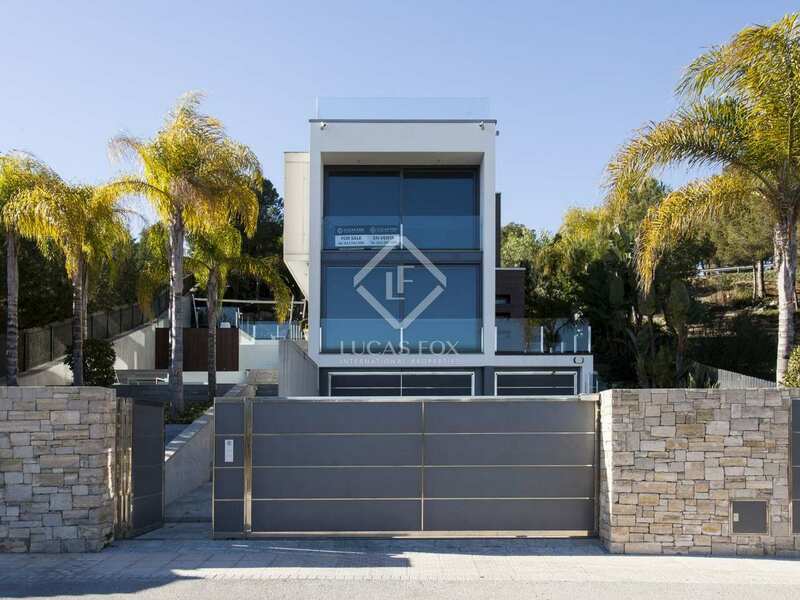 A 2-car garage and utility or storage room are located at the bottom of the house along with a gym, bathroom and sauna. 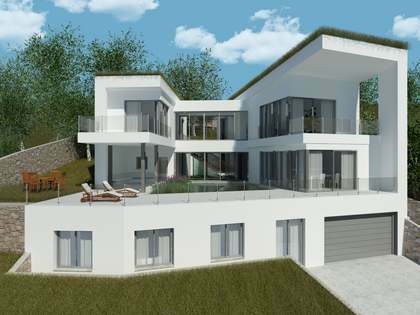 Additional features include underfloor heating, an alarm with sensors and a cutting edge home automation system. 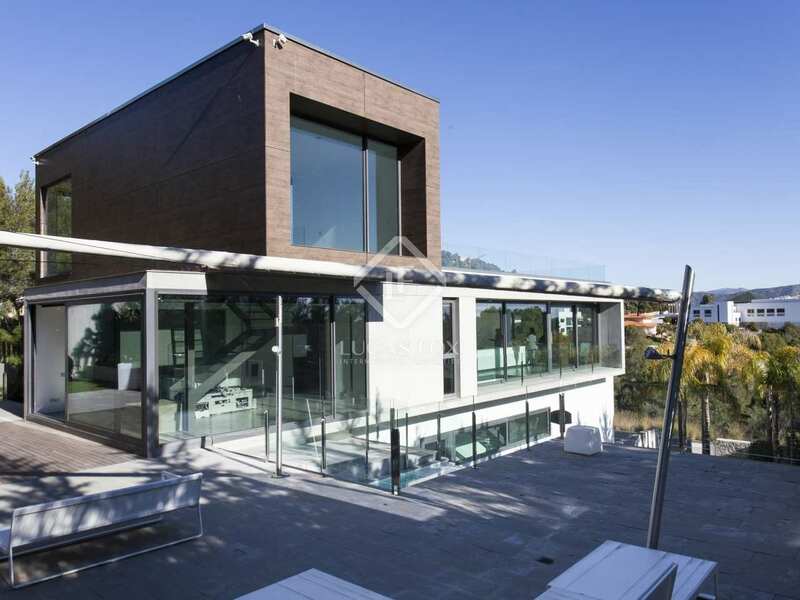 A magnificent modern residence in a peaceful, safe neighbourhood with enormous potential rental yield. 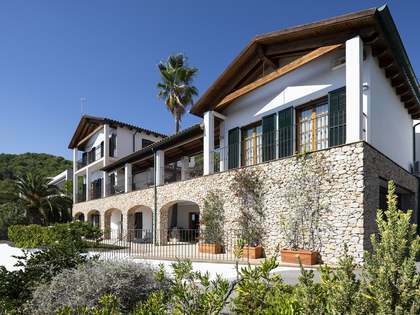 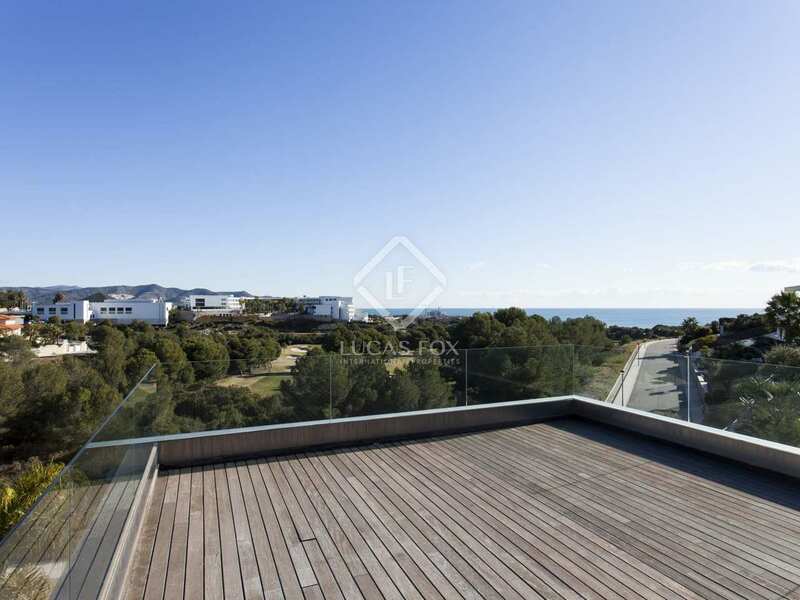 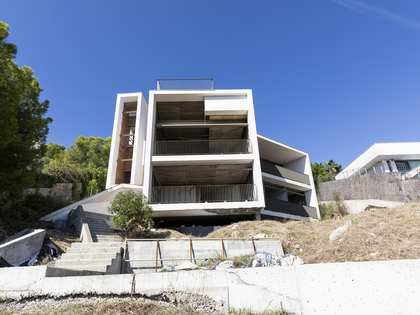 Superb location in the Can Girona residential area of Sitges, overlooking sea and golf course. Very quiet exclusive neighbourhood with 24 hour security.